As low as $47.98 per gallon! Triple Threat Selective Weed Killer is a selective broadleaf herbicide that will control weed such as Bindweed, Burdock, and Canada Thistle. You can dilute Triple Threat Weed Killer with water as it is highly concentrated to save you money. When diluted to the correct amount as stated in the directions, Triple threat herbicide will not only eliminate broadleaf weeds such as dandelions and morning glory but also woody brush weeds such as poison ivy, poison oak, sumac and honeysuckle. Coverage is absolutely tremendous because 1 concentrated gallon gallon diluted in 50 gallons of water will cover a large area up to an acre. All of the directions are on the label so you know what dilution ratio is needed for weeds such as Chickweed,Chicory,Clover,Dandelion,Dock,dogfennel,english daisy, frenchweed,ground ,hawkweed,healall,henbit jimsonweed, knotweed, lamsquarter and mallow. MCPP, 2, 4-D and 2, 4-DP to give you complete broadleaf and woody brush weed control. Triple threat is an EPA registered product. 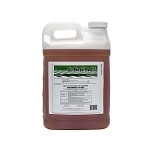 Another main feature of this selective weed killer is that it is for use on golf courses and ornamental turf areas. If you have another area with well landscaped turf around buildings, at home, or at fence lines, sometime weeds like muster,Pennywort, Peppergrass, Pigweed Plantain, Poison Ivy, Purslane, Poison Oak, Ragweed, Sheep Sorrel, Smartweed, spurge, and thistle grow there. 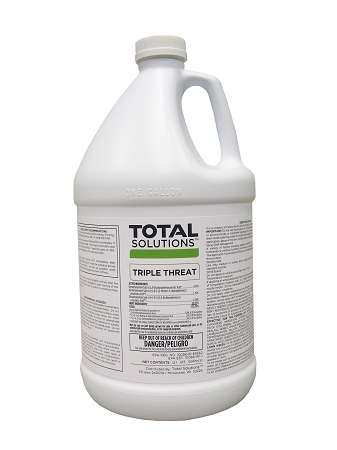 To eliminate them pick up a gallon of Triple Threat and keep those weeds down. From time to time during the growing season other weed species can infiltrate your well manicured lawns, turf, and landscaping. Weeds such as Wild Aster,Wild Carrot,Wild Garlic, wild onion, and wood sorrel can be hard to control. Using a broad spectrum selective weed killer herbicide like Triple Threat will make you job a lot easier so you can get back to doing what you like to do. Real important: Don’t forget - Do not apply Triple Threat to Dicondra, Lippia, St. Augustine and Clover lawns. Doing so will ruin these desirable grasses. Some of the new weed research suggests that applying a selective weed killer in the early fall can give better control of winter annual weeds. However, there is nothing to suggest that such early application would control spring-emerging annual weeds. Also if the area in which you reside has an infestation of poison ivy every year it's good to be ready to stop poison ivy growth before it gets out of hand. Having a gallon of Triple Threat weed killer will be all you need to control it at the height of the poison ivy growing season which usually peaks in June - July. Do you have Poison Ivy Now?